Here’s a quick summary of things I learned in the process. Staggered rows means uneven rows. If your pattern calls for staggered rows, then the rows starting with full blocks will be a quarter-inch longer on the top than the ones with half blocks. Knowing this from the start can reduce bowing and shifting later on. ¼” wide rows are obnoxious. If you’re inexperienced or looking for hassle free, pick a pattern that doesn’t have eight ¼” rows. I.e., not this one. Be careful second-guessing yourself. I spent hours drawing the layout up on the computer. I calculated exactly how I should cut my mid-block insertions for purple pieces. Then, I decided to change one of them in the quilt. After doing so, I realized I should have left it as originally planned. Of course, your experience may be the opposite. Poly micro-suede is not nearly as easy to sew as cotton. It’s a lot tougher, so make sure you have a sharp needle. I didn’t quilt in the purple areas because it’s just that much more difficult to sew through than the cotton. Trim stray threads as you go. Otherwise, you’ll spend a lot of time pulling them through seams and snipping them out of hard to get areas. Be aware of row alignment as you work across the quilt. My top was pretty out of square at the end. I maneuvered it back into some semblance of shape by steam ironing bits to stretch them as needed. However, it could have been avoided if I had paid attention to how the rows were aligning. With a staggered pattern like this, make sure that every other row is aligning properly with each other. Meaning, row 1, 3, 5, 7… should all have seams along a straight line. Mine did not line up across the quilt, which caused some of the out-of-squareness. Leftover fabric: I haven’t totaled it up, but I have at least a ¼” yard of most of the fabrics, and more of others. Granted, I purchased extra of many because I like them so much. I’m kind of un-adventurous when it comes to quilting so far. I decided to stick to simple stuff: echoing the purple curve. I used invisible thread on the top, and a teal (called peacock, I believe) poly on the bottom. My machine does not like Gütermann invisible thread. Something about the way it comes off the spool causes it to tangle around the horizontal spindle and eventually screws up tension. Halfway through, I managed to get it to work on the vertical spindle, but I didn’t want to tear out the first half, so it is less than stellar overall. After I figured out how to get mine to work, I came across this Quilter’s Review invisible thread comparisons article and comparison table. I wish I’d seen it before. I don’t even remember why I purchased the Gütermann thread to begin with (it’s been sitting in my thread box for a while). I’m usually a fan of the brand, but I think I’ll try something different next time—especially since the author of that article claims it’s the thickest of the six (I really hate the stiff texture!). I used a 50% Bamboo Rayon / 50% Organic Cotton blend batting, that is pretty similar in consistency to Warm and Natural cotton batting. Really, my choice of batting in this case came down to the fact that they sell a 60″ x 60″ packaged version, which was absolutely perfect for this quilt. Since I used a poly fill that I’d purchased for some previous crafting/couch reupholstering in the baby quilt, I wanted to work with something low-loft like Warm and Natural, and the bamboo/cotton blend seemed decent. It was very easy to work with, but I suggest pulling it out of the package and laying it out flat for a couple days or ironing it or something, because it holds the packaging folds. My teacher suggested possibly throwing it in the dryer on low or air with a very slightly damp towel just to release the wrinkles, but just laying it out flat overnight had helped enough that it wasn’t too much of an issue. As I expected, doing a 55″ square quilt on my machine was a little unweildy, but aside from the frustrations with the nylon thread and a few mistakes I made in how I’d planned to quilt it, it turned out okay, I think. Here are some photos of the front and back. The back of the quilt. In the detail, you can see that I have some wrinkles sewn in. I didn’t baste it quite well enough. I’m looking forward to my next class: we’re doing appliqué and free motion quilting, so expect something a little more exciting in the future! 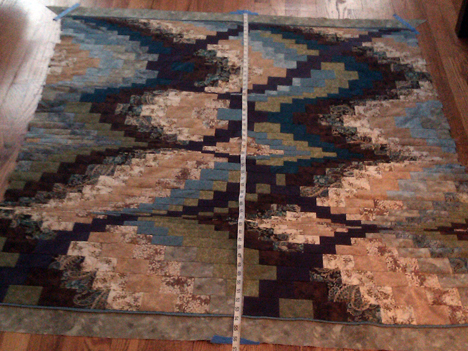 Now that the front of the bargello quilt is complete with borders, it is time to think about the back. Quilt backs can be simple—small ones can even be just a width of fabric—or complex. The most common form of backing is simply taking yardage and using it as-is (if wide enough) or sewing widths together until it is wide enough. I wanted to do something more exciting than that. Who says piecing is only for the front of quilts? Well, if someone did, I’ll have to politely disagree with them. You can do fun things with the back too, if you’re so inclined. It’s a great chance to use up extra blocks from the front, or fabric leftovers. Of course, it’s a creative process so I can’t really do a tutorial on how you should piece a back, but here’s what I did. After finishing the front of my quilt, I still had some of one color run left; by the time I got to the central strips, the two color runs had converged into the same exact order, so I chose to exhaust one completely by cutting the remaining strips from it, leaving a good 8″ left on the second. I also had a whole pile of little 3.5″ wide slices that I’d removed from all the rows for purple-block insertion, and a spare 1 1/2″ strip that I cut because I thought I’d lost the first one I cut (I’d actually sewn it to another strip in the wrong section). I decided to use the extra color run, strips and pieces on the back, filling in the remainder with the teal batik. Labeling is one of those things that is easily overlooked because it’s not vital to the quilt-making process. But, because I am giving this quilt as a late wedding gift to my cousin (the wedding quilt is in the long-term UFP pile), I thought a label recognizing their marriage is important. The way I decided to incorporate a label actually became part of my back piecing. Deciding to stay far away from embroidery, I chose to give printable fabric a try. 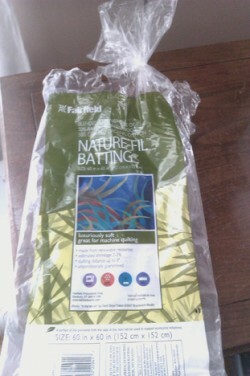 I picked up June Taylor Colorfast Printable Fabric from JoAnn Fabrics (with a 40% off coupon, of course). I hope to review it soon, but for now, suffice it to say that it seems to be somewhat color fast and printed just fine in my Canon PIXMA iP4300 (which is going on 4 years old now). I purchased white printable fabric, although you can also get cream. I figured white would allow a wider range of options in the future, since I’d have a lot left over. So, I printed a cream background to my label (which has faded a bit, hence the “somewhat” color fast). Having a border-less printer is really helpful here, as you either have to waste the printable fabric so that you can cut it down or have a printer that can do less than a 1/4″ margin on all sides of the label so that the white edges are hidden in seam allowances. My border-less printing settings weren’t behaving, but the print margins were < 1/4″, so all was well. The blurry bit under their names is on the photo for privacy. It doesn’t really look like that. It’s their last name and wedding date. Once I’d created a label, I put it in a strip created from all the extra color run pieces. The strip is mostly in order of the color runs, but begins to skip when I ran out of some colors. I enclosed that strip with two strips cut from the color run leftovers (well, one was that spare one I’d cut accidentally). I miscalculated the amount of fabric needed for the back, so I was short on the teal batik. I made up the difference using pieces of the other fabrics. Mainly G3 and B4, along with a lot of the black/brown paisley that was the original inspiration fabric and all the other little pieces left over from the front. I tried to use as little of the purple as possible on the back, because the poly is a bit harder to sew through than quilting cotton. One piece made it in as part of that stray slice I’d cut for the front. The full back, laid out on the living room floor. 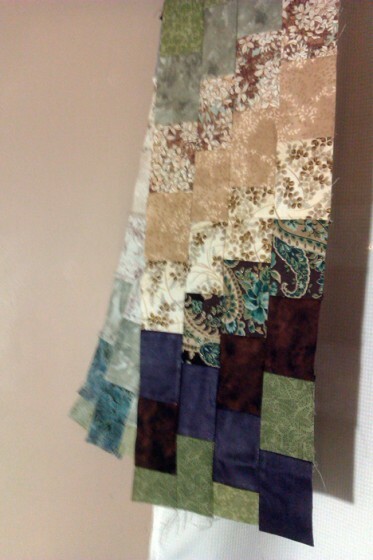 After sandwiching, I am not quite sure that the strip of piecing on the top of the quilt will actually be on the back. I may have miscalculated overhang by a few extra inches, but no big deal. I can always use it for something else! The result is a back that is a little more tailored and interesting than a plain back (not that plain backs are boring—they can be amazing to look at the actual quilting of the quilt, but it’s really better to ignore that on one of mine as my quilting skills are very amateur). Now it’s all sandwiched and waiting for me to quilt it! What tips do you have for piecing backs? Is it something you do for most quilts, or do you prefer basic backs? Now that the main section of the quilt is complete, it’s time to square it and add borders. This is the center of the quilt before borders. You can see how uneven the bottom is. My quilt top was badly out of square. It’s kind of demoralizing it’s so badly out of square. Make sure you’re paying attention to how rows are lining up across the quilt, not just within row groups. Had I done that, I think it would have helped a lot. Instead, I was steam ironing the heck out of one section of the quilt trying to square it up a little by stretching it to match other sections. I don’t know if that’s the most advisable way to do it, but it worked relatively well. At least, it made the edges mostly square, but you can see where the row seams do not line up across the quilt. The top and bottom rows are also not straight, because I had to cut an uneven amount to square up the sides. But, it happens sometimes, and you just have to roll with it. Top edges. See how the two sides have much different amounts being removed? The sides were mostly square, but the top and bottom weren’t. To square them up to add the borders, I taped the quilt to the floor, and measured center, then measured the top and bottom and lined up the borders so they were square, meaning that there were different amounts of seam allowance on the quilt top. 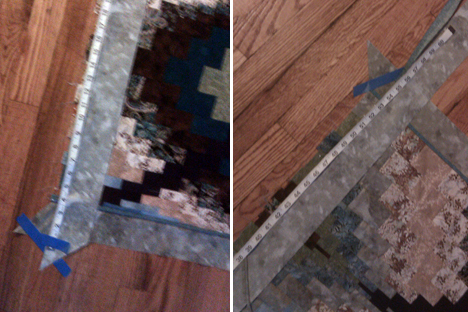 After sewing the borders on (using the 1/4″ border allowance to guide me), I cut off the excess. 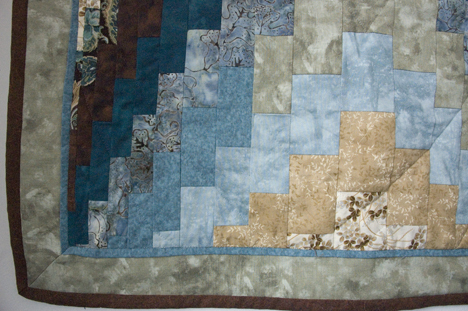 The top and bottom borders pinned on in a mostly square configuration. 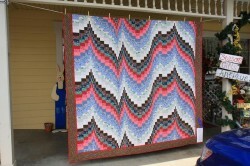 My teacher made one of the quilts from Twist and Turn Bargello Quilts by Eileen Wright. The prescribed border includes a 1/4″ strip much like the one Edie used on the pattern that I’m using. The catch is, Wright has you cut a 1″ strip, fold it in half, and simply sew one end into the seam, leaving the other loose (similar to a prairie point border). After sewing eight 1/4″ rows in my quilt, I decided that this was the best thing since sliced bread, and used this method rather than piecing together the strips normally. Wright also has you cut your borders on bias, which my teacher said made a huge difference in attaching them (much easier) and also hid any joins better than normal seams. Unfortunately, I didn’t have enough fabric to do borders on the bias, but it is something to consider in the future, for sure. Also, because of my out-of-squareness, I am relying on my non-stretchy borders to help square it up. 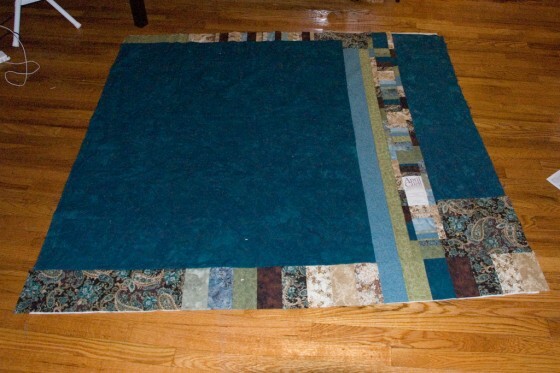 Bias borders would just bend out of square with the quilt top. Instead of doing borders with half blue, half green like Edie used (well, blue/brown), I chose to use a blue inner border and green outer border, with brown binding. 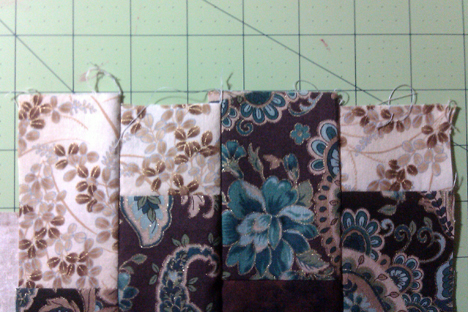 Edie’s pattern called for a 1/4″ inner border, 3/4″ outer border and 3/4″ binding, which I also modified. Mine are 1/4″ inner, 2 1/4″ outer (technically 2 1/2″, but 1/4″ is covered by the inner border), and 3/4″ binding. 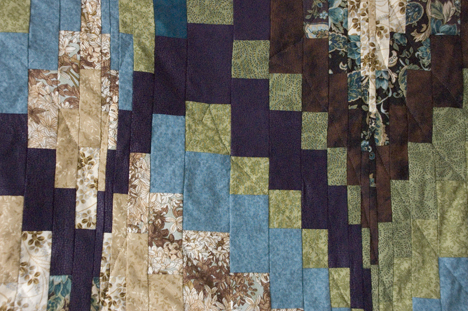 I added a wider outer border to infuse a little more color to the quilt. 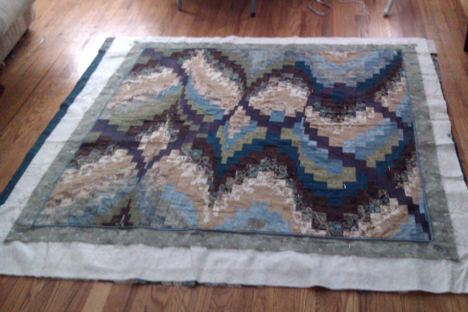 Once I finished the top, I felt that the browns and creams were overwhelming the blues and greens. Here’s the completed top, including borders. The hanging shot is probably the most color-correct. 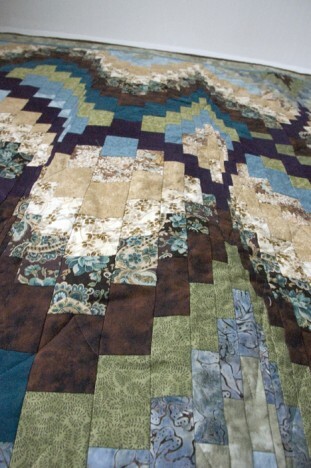 What tips do you have for squaring up quilts? What about adding borders? This is part five in a multi-part series. Keep following along by subscribing to the RSS feed, or view the related posts. You can also get a downloadable pdf of my pattern changes. So, back in November, I left you hanging about the progress of the bargello quilt. We didn’t have class in December, and I’m woefully behind because my machine was acting up and in the shop. But I have it back now, and it is time to get to work! Class this week focused on measuring and building borders, but I haven’t even completed the main part of the quilt. I need to finish it, have borders added and everything sandwiched for class in two weeks! Because of how the color runs require swapping in and out different rows to get the color shift, the quilt is best constructed from the outside in. The pattern groups strips into different sections (A*–H*), and in my layout, B, C, F, and G all have strip swapping. This means from C-E, I’m able to focus on one side at a time, which I’ve done. This is row groups A-D on the blue-dominant side. You can see two green shifts so far (of four total). Also, on the far right, I’ve moved into the more difficult mid-block insertion for the purple pieces. This is section A and B for the green-dominant side. Only one shift has taken place here, which you can just barely see on the left of the photo (that’s the back side, because the section is hanging folded in half). Overall, the progress has been pretty simple. Simply cut the right widths from the color run, swap out the required blocks for purple ones, and sew the strips together, alternating seam direction (sew every other one from the bottom up rather than top down). 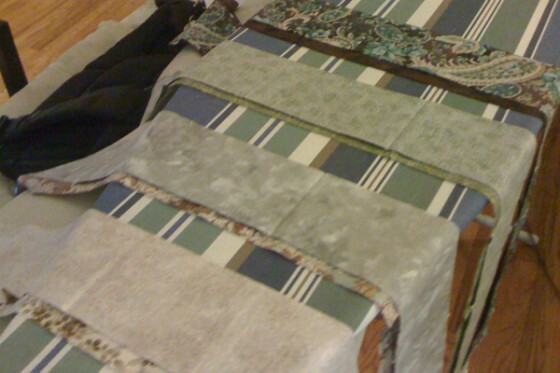 I’ve been sewing the strips for each group together (they range from 1–5 strips), then sewing each group to the next, rather than sewing each strip to the next for the whole quilt. As I mentioned when making the color runs, I think it lessens shifting and bowing. You can see in the progress above that my current progress isn’t exactly square, although the angle of the photo and pinning I did exacerbate the problem in the photo. One important thing to note when doing a staggered pattern like this is that the tops and bottoms of your rows will not be aligned. Rather, there will be a 1/4″ staggering effect because the half-blocks will not have the full seam allowance. 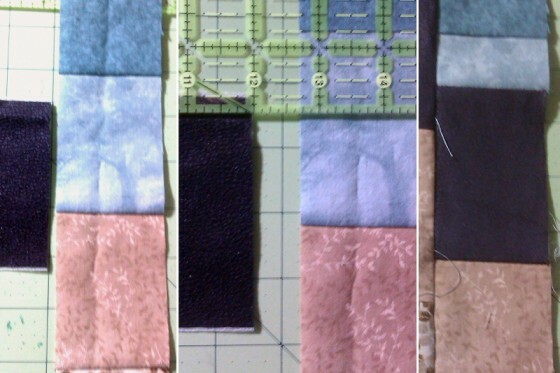 Instead of trying to line up the rows, I start pinning by marking the midpoint of the second full block down and matching that up with the correct seam on the connecting row, then back tracking. If I ever find that my strips aren’t matching up correctly, I simply use that method again later, and adjust the ease through the intervening pieces. Part of my issues with the progress being out-of-square is that I didn’t realize this until about 4 rows in. It’s much trickier on the narrow rows. For most rows, my plan to add in the purple contrasting curve simply requires removing one block from the color run and replacing it with a purple one of the correct width. For a few strips, however, this would result in the purple taking over the existing curve, which I don’t want. So, toward the middle of the quilt, you’ll start to see partial blocks. The first one in the blue-dominant side is apparent on the far right of the progress. 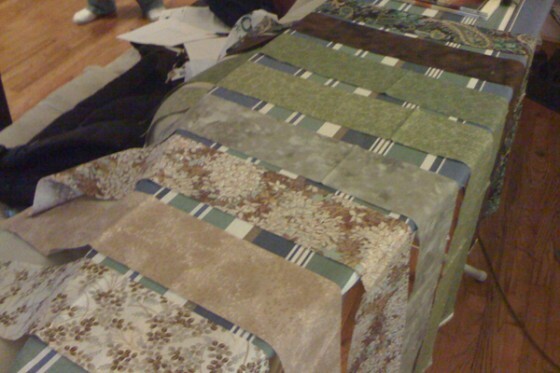 I accomplish this by cutting out bits of the existing blocks (keep your seam allowances in mind! ), and inserting the purple block midway, rather than substituting it for an entire block. There are a few more like this. You can see them all, and get exact measurements in my downloadable pdf of the pattern. I made a very amateur mistake while my machine was in the shop. I decided to start cutting out all the little purple blocks so that I could start pinning everything together and be ready to sew once I got the machine back. Then, I misread my notes and ended up spending an hour cutting out pieces that were all .5″ too short—I forgot the seam allowance. It’s really de-motivating when you do something like that. But, we all must soldier on. Even worse than the motivational factor is the fact that I don’t think I have enough purple left to re-cut all the pieces, so some of the middle ones will likely be pieced together, adding even more bulk and seams to the project. I’m hoping that I can get through all the strips with two purple blocks, and then piece together purple blocks for the center of the quilt, where there is only one block per strip. Do you have any tips and tricks to keep your runs from shifting? What about getting yourself back in the mood to work on a project when you really mess up (like my cutting problem)? This is part four in a multi-part series. Keep following along by subscribing to the RSS feed, or view the related posts. 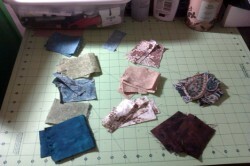 With the color runs done for the bargello quilt, it’s time to start cutting out the strips for the quilt top. On one hand, it sounds simple: the pattern from the book tells me the widths I need for each piece… I just need to cut, right? But, in practice, the color shift across the quilt, combined with my plans to insert the purple “pop” pieces meant graphing it all out was a superb idea—and also the next step in my homework, along with starting to sew the pieces together. My teacher suggested using Microsoft Excel or a similar program to graph it all out, so I started with that, but it wasn’t lining up in a way that made sense. When cutting and piecing together your strips for Bargello, you have two basic choices: line the horizontal seams up, or stagger them. The quilt pattern I’m using is a staggered pattern (think brick laying)—so when I blocked it all out in a spreadsheet, everything was misaligned. Working from a pattern that is not staggered would have severely thrown off my piecing, since it changes the starting color of each row. The first image has no color shifting. The second is the result straight from the instructions. 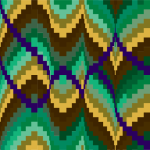 Before deciding to use the pattern as-is from the book (well, prior to purple-izing it), I spent some time playing around with the color shifting as well. It’s quite simple to just swap the color of the blocks, although the color is clearly a poor substitution for the actual fabrics. 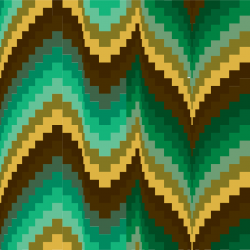 When the curve directly mirrors the main curve, adding in my accents simply requires swapping out blocks. However, when the curve happens to correlate with the main curve, that approach will result in the purple completely taking over another color for a few blocks, which I didn’t want. This results in some trickier half-block replacements in certain rows. Having this graph to guide me is immensely useful. If you’re interested in making a similar quilt or want to see a more detailed explanation of these modifications, you can download this pdf of my adjusted pattern complete with cutting widths. So, at present, I’m cutting out all of my columns and inserting the color shift blocks and purple accent blocks—which requires a lot of seam ripping. There’s no solid goal for next class—just to have started piecing everything together and to bring in any questions we’ve come up with. 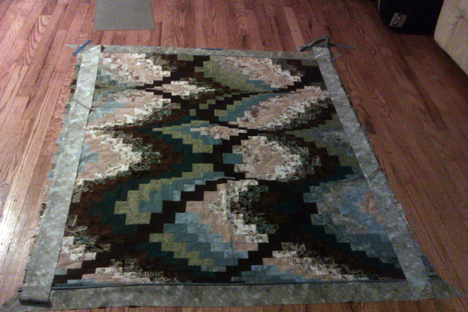 Next time I update, I’ll be showing you progress of piecing together the rows. 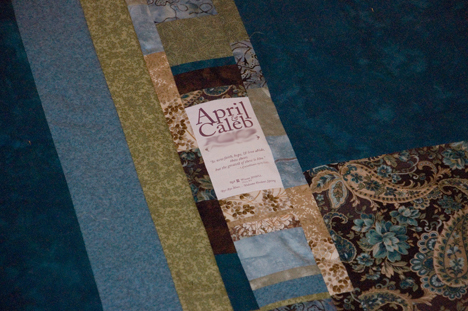 What tools do you normally use to plan out your quilts (bargello or other)? This is part three in a multi-part series. Keep following along by subscribing to the Sartorial Stitchery RSS feed, or view the related posts. Two weeks ago, I showed you my color choices and pattern for the bargello quilt I’m making as part of a bi-weekly class. Our homework before this week’s class was to create our color map and have all of our fabric cut into strips and sewn into color runs for the quilt. The color map of all the fabrics. 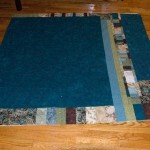 This is made from excess cut off while squaring your fabric prior to cutting strips. I simply taped each strip to a manilla folder, and wrote the strip number underneath. This helps you keep track of the order of fabrics. You can see my G/B designation for the two different color runs. 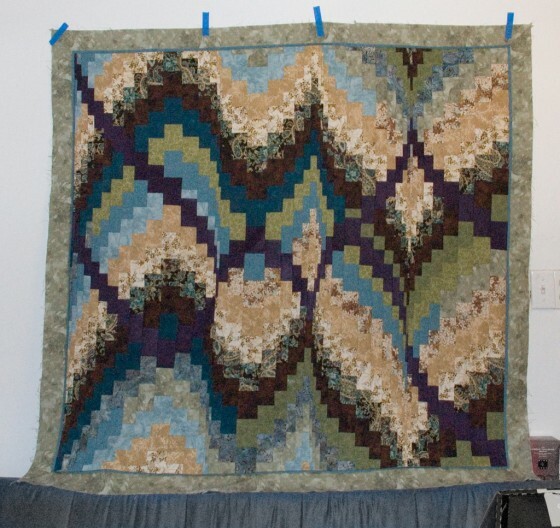 Bargello quilts are made by strip piecing, which means sewing together long strips of fabric, and then cutting the result to create the pieces used in piecing together the quilt. 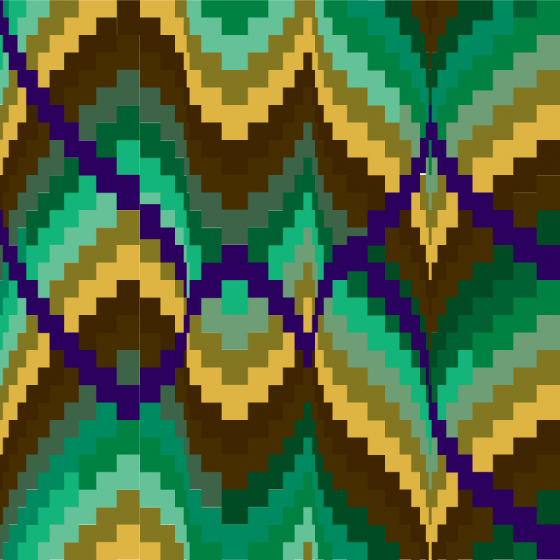 The foundation of the bargello technique is using strip piecing to create color runs: rectangles of fabric made from equal-width strips of your fabric. 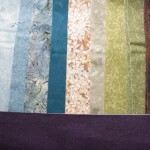 The color runs are then cut perpendicular to the sewn seams in different widths to create the curves of the quilt. The pattern I chose has rather tall rows—3″. 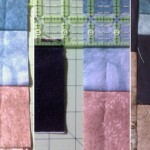 That means, all of my strips were cut to 3.5″ (for a 1/4″ seam allowance on both sides). Cutting was simple with a rotary cutter, mat and 6×24″ ruler. Then it was time to actually start sewing! The green color run strips. One place Wright and Edie differ is how to sew together your color runs. The most difficult part of this step is to create the color run without having the strips begin to dip in the center—called bowing. To counteract this tendency, both Wright and Edie recommend altering each seam direction as you create your color run. So, you sew the first seam in one direction and the next one the opposite, and keep switching back and forth. 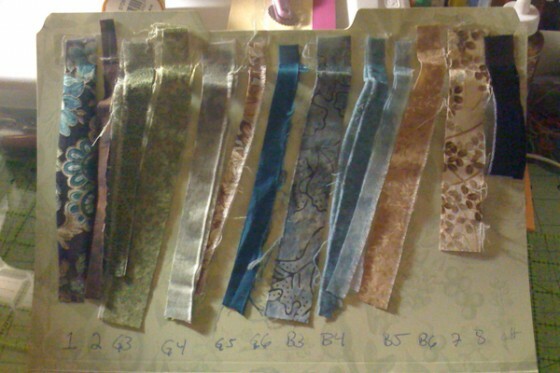 Wright suggests sewing all of your strips in pairs with the same seam direction: 1 to 2, 3 to 4, 5 to 6, etc. Then, you sew your pairs to each other with seams going the opposite way, continuing to sew the groups together until the color run is finished. Edie takes the sequential approach and has you sew each piece to the next in order, switching seam directions as you go. Wright’s recommended method is a bit faster I think, since you can chain piece all the pairs, and is the one I chose to use. Another place Wright and Edie differ is how to place the ends of the strips. Wright proposes to line them up evenly on one end, creating only one jagged end (due to differences between manufacturer’s fabric widths). Edie counsels arranging the ends based off the shortest strip, creating two jagged edges that supposedly allows you to have more useable strips. I figure, the shortest is the shortest, regardless of how ends are set up and used Wright’s way instead. Only one jagged end also makes Wright’s method a little less confusing: when you sew the pairs, you sew from the side where the edges meet. When you sew all the other seams, you sew from the uneven side; this is an easy way to tell which direction you should be sewing your seam. The two ends of the finished color run. (Okay, technically only half of the green color run.) 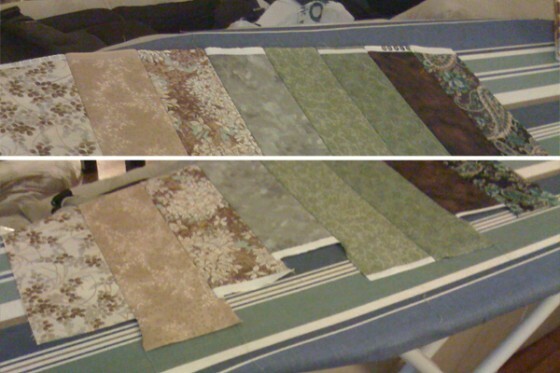 I was amazed at the difference in widths of “42″” fabric! Using Wright’s method, I didn’t experience notable bowing. In addition to the speed advantage that I spoke of, I also think that her method keeps you from making exponential errors. If you sew each piece to the next one, any previous bowing will continue to get worse as the issue is compounded down the line. When you sew the groups together, you don’t experience as much of an issue because you are working in smaller chunks that don’t inherit the mistakes of each previous piece. Unfortunately, I missed Monday’s class (and a day of work) with some sort of bug. I did find out today that the homework is to start cutting the actual strips from the color runs and piecing them together, so I’ll be talking about that in my next post. Also, please forgive me for the poor quality images. My phone’s camera had to do, as the real camera was unavailable. Do you have a preference for either of these methods? Tell us about your experiences in the comments. This is part two in a multi-part series. Keep following along by subscribing to the RSS feed, or view the related posts. 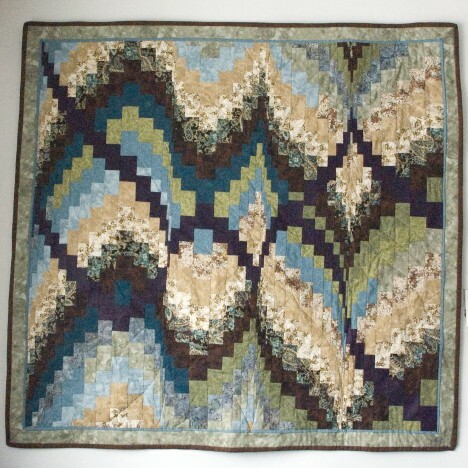 I’ve started taking a bi-weekly class on bargello quilting. I’m now two weeks in, with a pattern chosen and fabrics picked out. The class is structured so that we meet for an hour every other Monday, and then have homework in between. Last week’s homework was to finish picking out fabrics and get them washed and ironed before class this week. 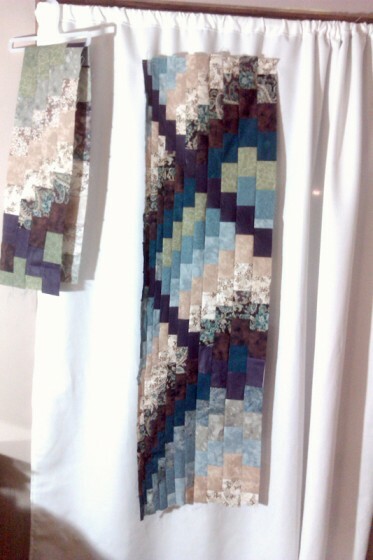 We also looked at different bargello designs and did a preliminary ordering of the fabrics to be discussed in class. While I’m eager to get started, I think the bi-weekly format will work great for allowing me to work on other projects and keep you all updated as well. Bargello patterning has its origins in needlework from 16th century Florence and Hungary. The term itself comes from works found in Bargello Palace in Florence. The style experienced a revival in the 1960s and has branched out to other media in the intervening years. 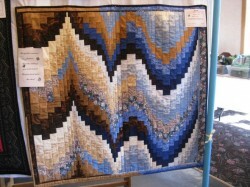 Bargello quilting has been gaining popularity for over 15 years. The style is classified by its gradated curves and points flowing through the design. 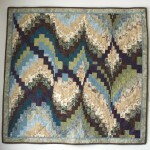 The simplest bargello designs are simple curves or waves that repeat in different colors and patterns. 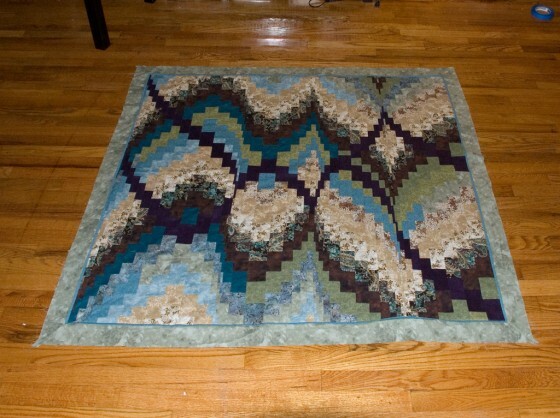 Ambitious quilters create beautiful designs that incorporate multiple curves, broken curves, color shifting and many other alterations to the basic bargello curve. 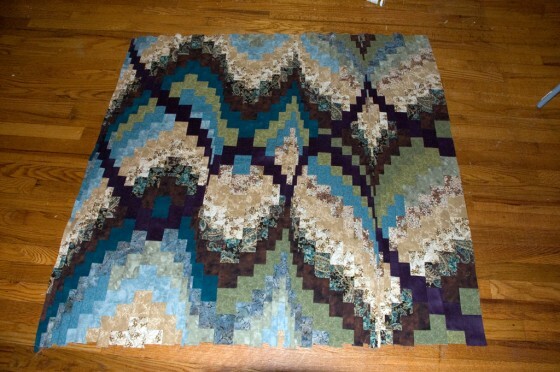 Bargello quilting is strip-piecing, plain and simple. I’ll discuss it more once I begin piecing my quilt, but essentially, you create color runs by sewing strips of the different colors together horizontally. Once you’ve created your color runs, you cut vertical strips from them in different widths to create your curve. You end up with blocks of each fabric that are all the same height across the entire quilt, but in varying widths. I started with Wright’s book, and ended up purchasing the other as well. While I love the curvy patterns of Wright’s quilts better, the descriptions in Edie’s book are more thorough. 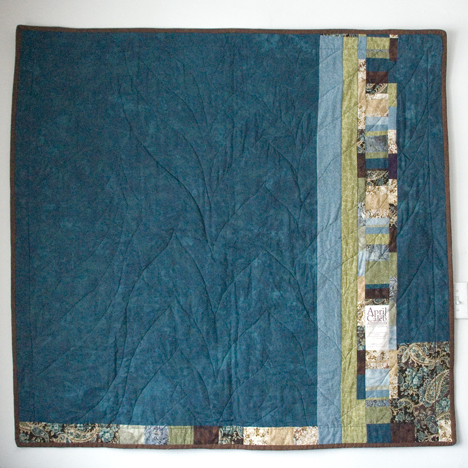 Wright’s does a good job of describing the basics and the steps to create her featured quilts, but Edie provides a wonderful description of how to create your own designs and how to modify them with advanced techniques for something more than simple curves. Looking ahead, Edie takes an odd approach to piecing the rows; she sews the rows to the batting while piecing the quilt together, rather than making the quilt top in one go, then sandwiching. I’m not sure which method we’ll be using, but Edie’s sounds like it will take some getting used to. One thing of note: Wright is a fan of using many more fabrics than Edie. The majority of her designs call for 20 fabrics (one is even 24! ), whereas Edie’s generally require somewhere around 12 (19 at the most). A quick search on Amazon.com turns up many more books on Bargello Quilting if you’re interested in the subject. After a lot of debate, I decided to do a twist on one of Edie’s quilts. The goal of the class is to create a wall hanging, but I’d like to create a project that can be used as a lap quilt instead of a wall hanging, depending on who I end up giving the final product to. Edie’s “Bye-Bye Blues” quilt is a decent size (52″x52″) for that flexibility. 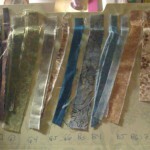 I chose my fabrics before settling on a final pattern. 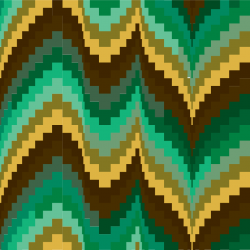 I found this beautiful paisley of teals, greens, browns, tans and a highlight of gold, and took my color cues from it, coming up with a palette of browns, greens and blues—and a deep purple for a funky twist. The fabrics are a mix of batiks and prints with an overall floral texture theme. I ended up with 18 different fabrics. I purchased a couple for other projects (mainly the wedding quilt), and ended up with leftovers (or didn’t use them). Two are reasonably reversible—providing a lighter shade—so I ultimately have 20, which is what the original pattern I chose from Wright’s book called for. The final pattern choice only needs 16—and 4 of those will be doubled, so the final fabric count is 12. I plan on adding the deep purple as a counter-curve through the design, so the total is actually a baker’s dozen. 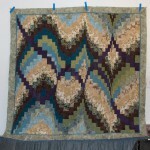 Edie’s original pattern is a color shift from blue tones to brown ones. 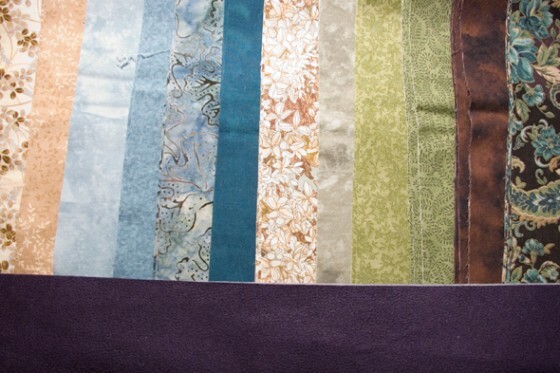 With my selection, I am planning on having the brown and beige rows span the quilt, but a gradual shift from blues to greens across the lighter section of the curves, with the purple inserted in place of other blocks for a contrasting curve. 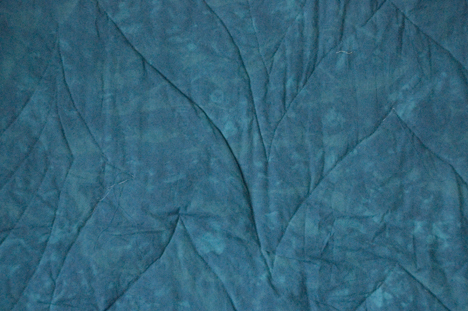 I’m thinking a good name for my quilt will be “Bye-Bye Blues… Hello Greens,” or is that too cliché? Do you have experience with bargello quilting? Interested in learning more? Let me know what questions you want answered as I journal this quilt. This week’s homework is to get the strips cut (done) and sew the color runs together. I’ll document that process as I go. See you in two weeks! This is part one in a multi-part series. 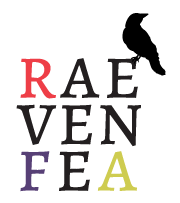 Keep following along by subscribing to the RSS feed, or head over to part two now.